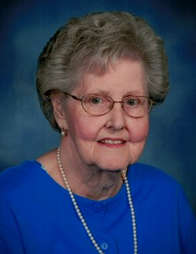 Johnson (nee Manchester) of Avon Park, FL died July 29, 2018. Born June 6, 1932 in Ludington, MI, she lived her almost 40 years of marriage in Rockford, IL before relocating to Avon Park for her final 22 years. Survived by her sons Douglas Johnson (Marcia) and Kenneth Johnson (Marilyn), six grandchildren, four great grandchildren, and siblings Janet Wengert (Deni, deceased), Pamela Larsen (Ron) and Allen Manchester (Diane). She was preceded in death by her husband Romaine Johnson, son Dwight Johnson, and a brother. A graduate of Trinity International University and the Swedish American Hospital Nursing Program, she taught Pre-Kindergarten for Rockford Christian Elementary School for 25 years and served as the Children's Program Director and AWANA Director for First Evangelical Covenant Church for many years. Memorial Service at First Covenant Church, 316 Wood Road, Rockford on September 15, 2018 at 1:00 p.m., following a private family interment at Scandinavian Cemetery. In lieu of flowers, memorial gifts may be directed to KICY and World Vision.